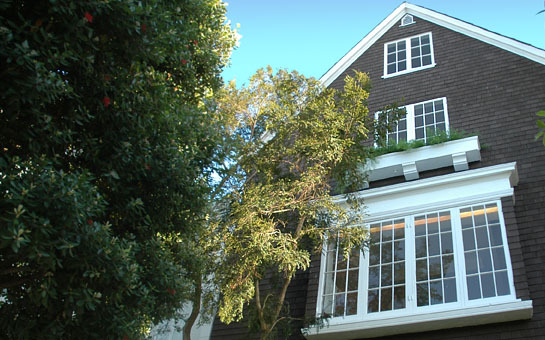 This classic shingled home, with a sunny walk-out south garden and modern elevator, was designed at the turn of the last century by renowned architect Ernest Albert Coxhead. 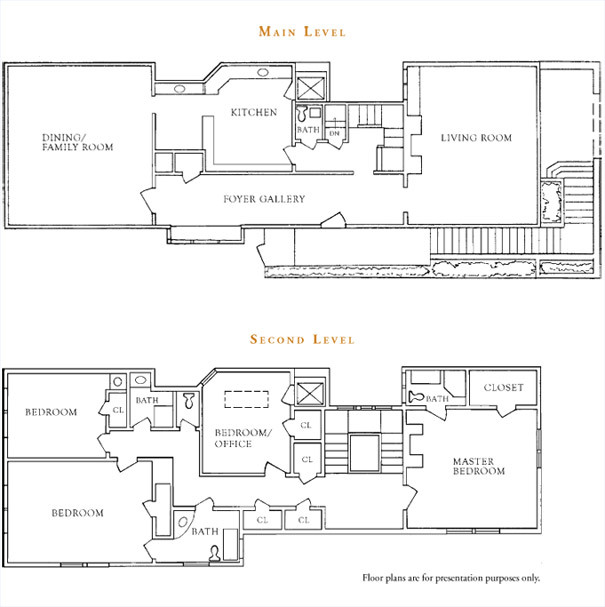 It rises four stories above the pretty tree-lined Washington Street on a block with some of the most beautiful homes in prestigious Presidio Heights. The signature ivy-covered brick archway at street level is topped with three tiers of white framed windows ending at the peaked roofline. Brick steps lead to the handsome entrance featuring an ornate entablature over the front door with sidelights. A gated walkway gives access to the terrace and garden. Enter the light infused, long FOYER GALLERY, a perfect backdrop of white enameled paneling for an art collection and built-in window seating in the wide French paned window. Beautifully refinished floors are introduced here and throughout the house. The classic LIVING ROOM features a wood mantle with marble surround, boxed-beam ceiling, built-in bookcase and window seating in front of four sets of paned picture windows with outlook to the pretty tree-lined street. The spacious FAMILY/DINING ROOM opens to the sunny TERRACE & GARDEN for delightful easy flow indoors and out. Flower boxes are filled with colorful blooms; large camellia bushes, other greens and fruit trees add height and texture. A BREAKFAST ALCOVE adjoins the spacious KITCHEN. There is also a POWDER ROOM, guest closet & elevator access. Ascend the handsome staircase with carved wood banister and paned windows to the 2nd floor landing with built-in bookcases. The MASTER BEDROOM with fireplace looks onto the lovely homes across the way and beyond to the Bay. The MASTER BATH with shower and large walk-in closet adjoins. The middle BEDROOM/OFFICE has a large skylight and an elevator stop. Two very spacious and sunny BEDROOMS look over the garden. Two additional BATHS complete this level. Sunny, south BEDROOM with garden outlook and BATH with tub.